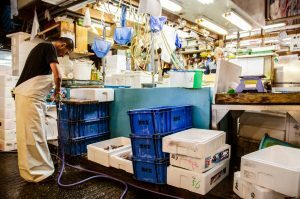 Last weekend, Tsukiji Fish Market, which has long been one of the city’s most iconic attractions, has finally closed for its relocation. 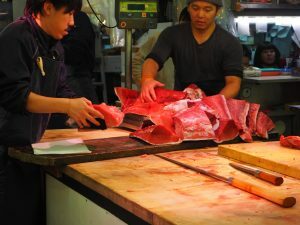 It may have been a long time coming but Tsukiji’s final closure definitely marks the end of an era for the city. This news reminds us those days we used to operate the walking tour at inner fish market. Tokyo Metropolitan Government starts demolition from today, and the space that the market leaves will possibly be be turned into a transport hub to cater for the 2020 Olympics. 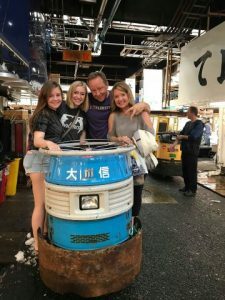 We would like to thank Tsukiji inner market from the bottom of our heart, and we’ll do our best to guide you around the outer market, where you can still wander the aisles of this colorful, chaotic market you’ll observe everything from sea urchin to octopus arranged for sale. For inquiry, please feel free to ask us any further information. Thank you!! 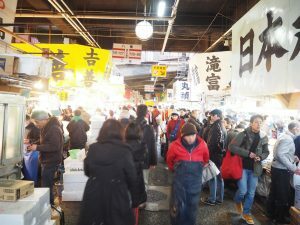 Countdown for NO ENTRY for Tsukiji fish market!